I recently brought my friend, voice-over legend Don Wescott, to speak to a group of students who’ve made voice over demos with me. Members of the group asked Don how he got started and how he practiced. He said he spoke great poems aloud. It makes sense. Poems are shimmering expressions of honesty that provide vivid imagery and intimate connection with the reader/listener. They are often painfully beautiful because they are intimate, immediate, and truthful. A really insightful and potent poem provides you with that gratifying “aha” moment that makes you feel really alive. Awake. I offered the Art of Speaking Poetry last February and again in May, because I wanted a verbal antidote to the daily toxicity of news and the corrosive assault on truth and decency. I was heartened that so many people signed up and brought beautiful and personal pieces to explore. The workshop experience was profound and gratifying. Each person dug into their soul and found their authentic voice. Amid laughter and tears, we recorded the pieces, and with the brilliant sound design of Kevin McLaughlin at Soundtrack Recording Studio, these gems were created. I feel that I need more poetry now and I imagine I am not alone. 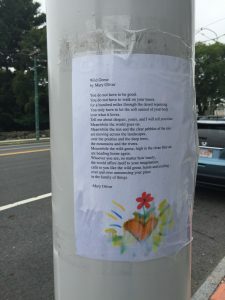 The other day during a walk, I saw posted on a telephone pole, Mary Oliver’s gorgeous poem, “Wild Geese” with hand made illustrations (see photo). I stopped and took this photo and was grateful to the person who made this poem available to anyone passing by on their way to the pizza shop, the cleaners, the cafe or the tailor. You know what would be terrific? POETRY GIFTING. Why not send meaningful poetry to someone who means a lot to you? A poem that provides a moment of clarity. A new fresh perspective. A personal connection of humanity. Something that nourishes the spirit. Feel free to download and use any of of these pieces. Or record a piece of your own. I plan on offering the Art of Speaking Poetry a few times during the year. If you are interested click here for information about upcoming classes and workshops or email me at wren@wrenross.com.